FROM every indication, the coming elections, especially that of the president is bound to be the most keenly contested in Nigeria's political history. This is because the two leading candidates are from the north which by existing Zonal arrangement should produce the president for eight. More so, the two are evenly matched in terms of popularity and other indices. However, opinions and views are sharply divided as regards what experts considered to be the basic requirements for choosing leaders. And these are character, capacity and competence. Opponents of the incumbent, (President Muhammadu Buhari), agreed to a very large extent that he's got a lot going for him when it comes to character; they however argue he's grossly deficient in capacity and competence. They pointed out his seeming inability to proffer lasting solutions to the myriads of challenges confronting the nation since assuming office from economy, infrastructure, power, education and insecurity to mention a few. They scored him very low so far having romped to power on the mantra of change, and the resolve to fight insecurity, grow the economy and provide employment for the teeming youths of the country. They somehow rubbished his acclaimed military experience as a ruse and are quick to describe his sojourn in government the last time out as a disaster of monumental proportion which tragically is repeating itself. His military background and expertise, according to them, has so far had no meaningful bearing on the nation's fight against insurgents. The fight is far from over. Boko Haram they insist still troubles the country's Far East and has recently killed over hundreds of Nigerian troops. *Incumbent President Buhari and his vice, Prof. Osinbajo. Armed banditry and other social vices have spiked in close to four years of his administration. All these they pointed out as proof of his chronic and incurable lack of capacity and competence. Above all, they would not buy his administration's claim to have recorded substantial success simply because the dreaded insurgents no longer hold territories within Nigeria. To them, he's not fit to govern and should be retired to Daura, his ancestral root to go and tend his cattle by the electorates. Let's wait and see if their wish will come true. In contrast, the supporters of the challenger, Atiku Abubakar, are of the strong opinion that he ranks over and above the incumbent in the area of capacity and competence. As for his character, they make a case for him that he's not entirely a bad product compared to the incumbent. Everything is down to perception. They based their assessment on the fact that he has done very well for himself in his private business endeavors, unlike the incumbent who publicly confessed he doesn’t know how to make money, since exiting public service decades ago. It's on record that he has chains of thriving businesses scattered across the country. But those on the opposing side had countered that the core of his wealth is from Nigeria's commonwealth, after all, he has served in the custom. They question the money he uses in building his business empire as proceed of various corruptly undertakings while in service. That again is yet to be proved in any court of competent jurisdiction. And so far it remains a mere hearsay or guesswork. As things stand, the die is cast. And it's either the incumbent or the challenger. It's either the APC or PDP. The reality that poses tragically of our political situation is that the numerous other political parties and their candidates have been eclipsed by the popularity of the two candidates and their respective parties. Interestingly, for some time now, politics in Nigeria has been reduced to a contest of popularity as against that of character, capacity and competence. While the political battles rage on, people (the lowly and mighty) from the various political divides are already taking side and are vigorously campaigning for the candidate of their choice. The chief amongst them or us as you might want to put it is Olusegun Obasanjo, the two times former president of Nigeria. Historically speaking, he has singlehandedly directly or indirectly influenced or superintended the ascension into office of virtually every president Nigeria has had since 1999. It might even be said that his colossal influence dates back to the second republic where he supervised the transition election that brought President Shehu Shagari to office in 1979. But as a political catalyst, he has in a way had a hand in the emergence of Goodluck Jonathan and the incumbent Muhammadu Buhari. And history also will credited him for pulling off some political drama that led to the ouster of Goodluck Jonathan allegedly because he did not honors or defers to him enough 'as the politically holy one of Nigeria' in the scheme of things while he held sway. Midway into this administration or thereabout, he suddenly woke from his political slumber allegedly due to the distraction of pursuing his PhD program at the National Open University of Nigeria. (NOUN) to sound it out clearly that president Muhammadu Buhari must be removed from office for what he called 'the under performance of his administration'. And he specifically called for the creation of the 'political third force' to achieve that. Indeed, there were activities pointing in the direction of possibly birthing such expedient political force majeure. A number of novel names were reportedly suggested and it all looked destined to come to past. But sooner than later it faded away and nothing was heard again. The idea died mysteriously you might say. And you will think the political old war horse has given up, not true to type though. However, only few days ago, he came up yet again with a 'sixteen page' statement which amongst other accuses this present administration of acting in the manner of military dictatorship and he expressly compared it to the era of former military junta, General Sani Abacha. While thanking Buhari for his service to the nation in his capacity as the president so far; he, however, thinks he's too old and weak; and needed to be saved from his misery. Above all, he believed Buhari lacks the requisite competences to take Nigeria to the next level which interestingly is the campaign slogan of the administration. Like it was when he called for the third force, his concerned this time around has gained traction and generated debate needlessly. He has in the heat of politicking for the 2019 presidency rated Atiku over Buhari just like he rated Buhari over Goodluck Jonathan in the lead to 2015 presidential election. If Jonathan's sin was not consulting with him on a number of governmental decisions; Buhari's sin is that of old age amongst others. The same Atiku whom like an elder that’s annoyingly drawing on the over flogged proverbial benefits of experience he had vowed then never to pass in Otta apparently because he failed in Minna after it was reported that Atiku has visited IBB in Minna purportedly to water the ground for his presidential ambition. Today, perhaps because the ‘sun is about to set’, the two had mended the fence badly pulled down over their differences as president and vice president from 1999-2007; and Bishop David Oyedepo was the blessed peace maker. While the Obasanjo has every right to hold an opinion, political or otherwise, and a strong one at that being a former president, it's, however, high time Nigeria and Nigerians stop pandering to his political mind game consciously or unconsciously. Experience has shown clearly that his choices have not always turned out to be the best for the country. If possible, therefore, Nigeria's electorates should vote another neutral candidate. But it's looking more unlikely given the available political indicators and calculations. The fear is that we're bound to choose between two northerners and if Atiku wins, that might likely alter the existing political arrangement that the north will serve two terms of eight years and the south takes its turn. He belongs to a new political party and may not want to respect that insisting he want to go two terms too. And that might likely create another round of political tension in the country if what happened after Jonathan presidency are anything to go by. Again, all this while Obasanjo has acted as the political saint and our messiah yet as it turned out all his anointed candidates have fallen far below great expectations Nigerian had of them. 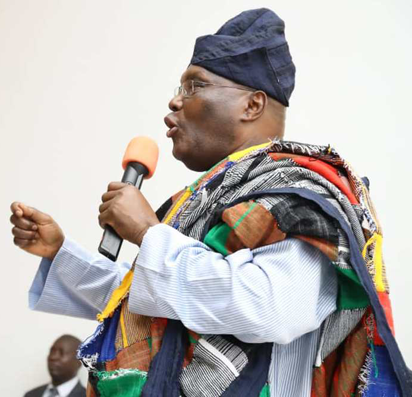 And from the way things are going for want of credible alternatives that might serve his desire to effect a change guard in the polity, Atiku might just be another pawn in Obasanjo’s time tested political chess game. But should it always be like that? The answer, definitely, is no. The overriding idea behind this construct is that the choice of Atiku, Buhari or any other candidate as the eventual president of Nigeria should be down only to the merit of their case and not because somebody or group has endorsed them. At the end of the day, whoever wins will be answerable only to us and not to an impulsive and compulsive godfather like Obasanjo. And to do this, continuous issue based engagements among the different classes of people and ethnic nationalities that comprise the country should be promoted. By so doing an era of Obasanjo or its ilk playing the gods over the political and economic destiny of Nigeria is brought to a close.